We are affiliated to IAMRoadSmart. Our IAM group number is 4246. The first bit means that we love to ride. If it has two wheels, we’ll have a go. Riding on the road is the essence of our riding and our training, as we are affiliated to the IAM. Many of us also do track days, off-roading, touring and race schools, in the knowledge that the skills learned can be transferred to the road. And because it’s fun, too. We organise regular ride-outs, weekends away and even the odd foreign jaunt. Mostly we just want to enjoy riding bikes. So we do. The second bit is about a process of continuous improvement. None of us knows everything and we’re pretty sure the perfect rider hasn’t been born yet. So what we do is not just turn out Advanced Test passes, but Advanced Riders (which is not necessarily the same thing). An Advanced Rider to us is someone who has already reached a certain standard but who wants to move on and improve further. Take a look at our trainingpage to see how we support this. Over 50 members make up H.A.B, from all age ranges. Bikes range from 125cc to 2300cc and with just about every different type of bike represented. Age or bike type (as long as it’s over 125cc) is no barrier to learning a Skill for Life! HAB is run by an elected Management Team, voted in each year during the AGM. These people give their time and energy for free, to ensure HAB continues to provide quality training in a professional manor. John began riding a scooter (Vespa 150) when he was 16, passing the ‘round the block’ test a few weeks after his birthday. Swapping 2 wheels for 4 until 40 years later when another scooter was quickly followed by a brand new Suzuki 650 Bandit. Terrified it would kill him he immediately enrolled on the IAM Advanced Rider Course with the Harrogate Advanced Bikes and quickly felt lots more confident and competent on the bike. 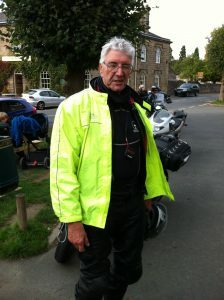 Once passed the test he felt compelled to help others do the same and trained to be an Observer with the Club and is now a Roadsmart National Observer. Our Chief Observer is Bob Hill. He started bike riding on a scooter, a Vespa 125 age13. He took his test in 1965 on another scooter (Lambretta LD150), graduated to a BSA Bantam and then a Triumph Bonneville which a was a dog. After numerous attempts to make it go faster he succeeded and it was written off. At that stage Bob was training to be an architect but gave it up for some fun in the Army. Bob left the Army 15 years ago and is now married, living in Harewood . In 2002 he joined a biker group and was prompted to get some rider training. So in 2003 he joined the IAM and HAB. He particularly likes long distance and cross country riding. In the last few years he has had a Kawasaki GTR 1000, a Motor Morini Dart and now has a Ducati Multistrada, a BMW K1200RS and a Honda XR125 which is actually Kate’s but he rides it! 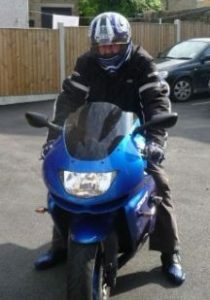 Bob enjoys tinkering with bikes and does all his own maintenance and repairs. When asked what his dream bike would be and he found that difficult to answer as really any bike would do. However he would like a ride on the latest Ducati Panigale. I first rode motorbikes on a field with friends when I was 14 and progressed from there to a Lambretta Li150 at 16, because my parents thought scooters were safer than motorbikes. I passed my two wheeler test in 1966 and since then, I have been an on/off biker, owning a Suzuki GT250 two stroke first, then a Moto Guzzi 850 T5 and finally part exchanging that for my present bike, a Suzuki GSX 1250 FA, in October 2013. I did the Police Bike Safe course in 2016 and an observer on it was from an Advanced Motorcyclists Group, who suggested the advanced course. I passed my advanced test in November 2017 and was then asked if I would stand for treasurer of HAB. So here I am! I started riding as a young lad with dirt bikes and anything I could get my hands on, First bike was an old FS1E that we used on the farm. I was always tinkering with bikes and would tune/modify them, strip them down, chrome the frame, powder coat wheels etc. My first big bike was a GSXR750L in the ’90s. A fantastic bike but I was a typical young new rider. Fortunately, I never came off. With a family etc I then had a gap from biking to my 40’s. I then bought a ZX9R, totally on a whim. It was very nice but probably not the best choice for how I wanted to ride. 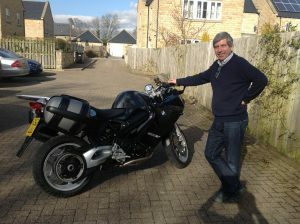 Now I have a Tiger 1050 which is excellent with a very flexible engine and all-day comfort. 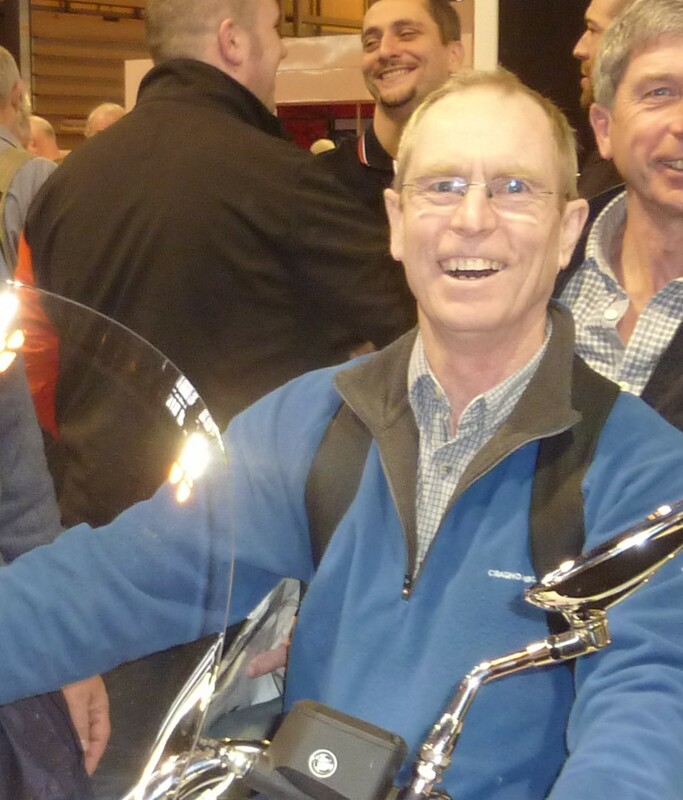 Peter started his biking life in 1973 on a brown and orange Lambretta SX175. His pride and joy was his for £34 in cash and £4 in gift vouchers! He graduated to a GP200 by which time he was living in Barking and spending his weekends in Yorkshire. The M1 winter commute eventually took it’s toll and the Lambretta gave way to a Hillman Imp Californian – that had a heater and other benefits for a single man. Two Yamaha’s followed in the 90’s – an RD200 which he kept until this year and an FJ1100 which came to a violent end shortly after he sold it in 2003. 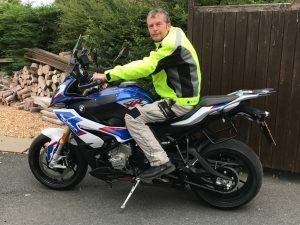 Phase three started in 2015 with an R1200ST (which helped him through his IAM test), followed by the inevitable GS later that year. The GS gave way to an S100XR in 2018 that now shares garage space with a 2012 T100, a Duke 390 and most recently a K1200S “winter bike”. Peter is married to Karen who recently swapped her “best ever” R1200R for a Street Triple 765 to keep her Duke 390 company. She too is looking for a winter bike and a bigger garage!